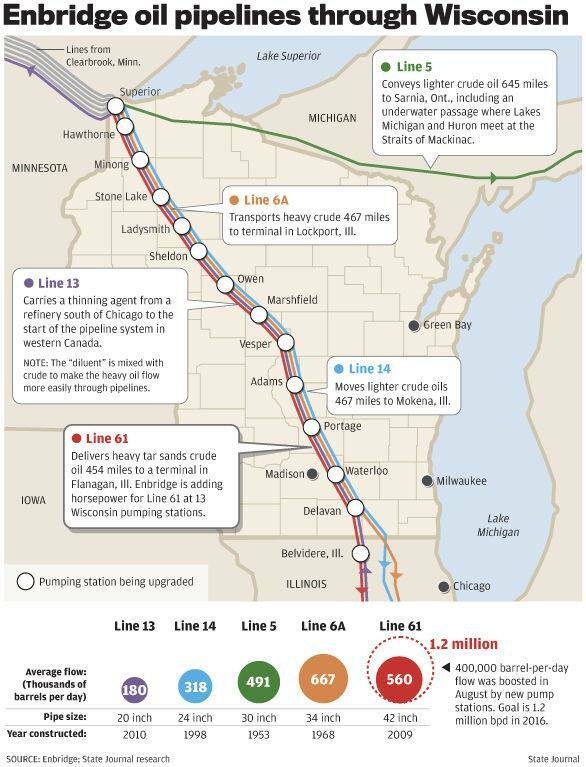 On August 1, 2016 Enbridge, Inc. announced that they were investing in the Dakota Access Pipeline (DAPL), and that once the deal was done, they would be abandoning the Sandpiper Line that was to run through northern Minnesota and the White Earth Reservation, and hook up with the Twin 66 that cuts across Wisconsin. Over the past several years, a well-organized resistance led by Winona LaDuke and Honor the Earth has forced Enbridge to abandon the Sandpiper Pipeline. DAPL, however, is being met with an even greater resistance, as members of First Nation tribes are gathering in unprecedented numbers at the Standing Rock Sioux’s Sacred Stone Camp, a water protector camp at the site of where the DAPL is slated to cross beneath the Missouri River. 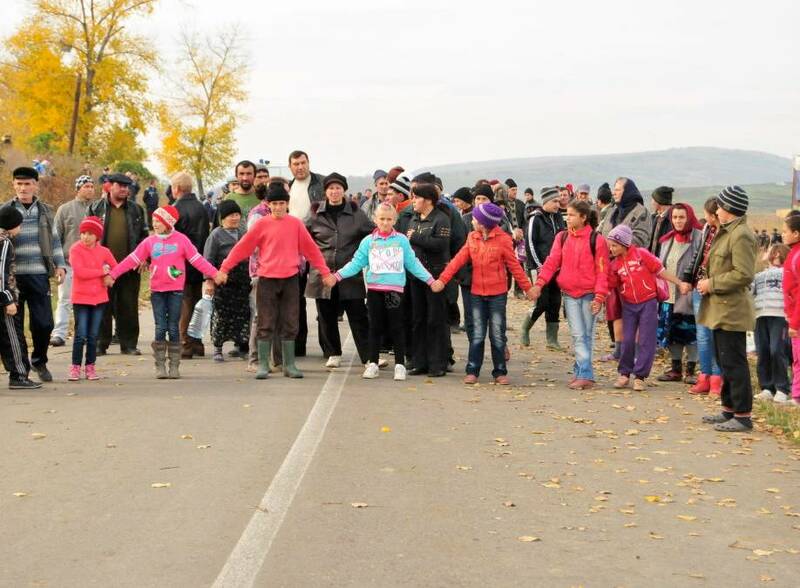 What started as a small group in April has grown to 1500-2000 people from all over the world who have come to stand united in defense of the water. This summer, another group of water protectors walked the Twin 66 pipeline, Enbridge’s project that was to run through Wisconsin. With the Sandpiper all but abandon, expansion on the Twin 66 is likely to halt as well. But water protectors spoke at a press conference on July 6, 2016 on the site of the Enbridge/Namekagon River crossing. Ironically, it was there that Gaylord Nelson came in the 1960s to announce the Namekagon River being named as a wild and historic river and protected by federal laws. A hearing is being held in Washington DC on August 24th to determine the outcome of the current standoff in North Dakota. The Standing Rock Sioux filed a motion for preliminary injunction to force the U.S. Army of Corps of Engineers to withdraw its approval for the project. After that, members of the camp will be prepared to dig into their resistance and prepare for a long winter. 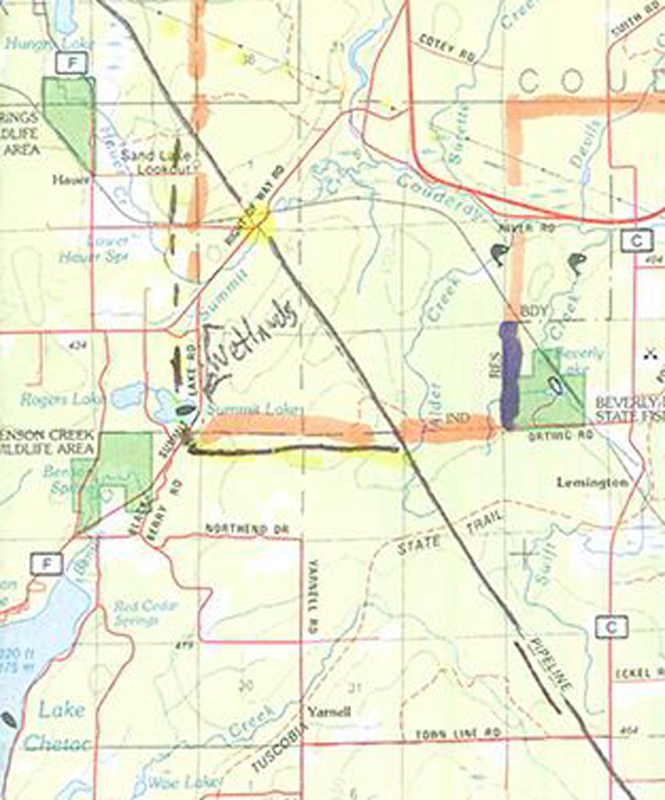 Lac Courte Oreilles Reservation is marked in orange boundary. The pipeline easement is the straight black line running diagonally through LCO. The new easement for #61 and #13 runs outside and along the reservation border. The Enbridge pumping facility is about 1/4 mile north of where the original easement in black crosses right of way road (yellow). 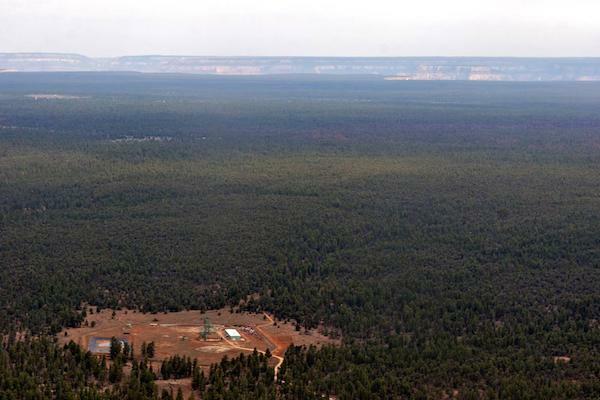 The tribe receives no money for the easement or facility on their property. The Lac Courte Oreilles Ojibwe Tribe will be hosting lodging and meals for those walking on the 33 Days on Twin #66 Pipelines Awareness Walk on July 3-7th, 2016 at the Honor The Earth Pow Wow Grounds (HTE). The public is welcome to join them as they walk a 15-mile section each day from Ladysmith to Iamalone (July 3), from Iamalone to Meteor (7/4), from Meteor to Stone Lake (7/5), from Stone Lake the Hayward (7/6), and from Hayward to Gordon (7/7). Walkers will be transported to and from HTE grounds to the walk starting site each day and back at the end of the day. July 3rd and 4th: Maryellen Baker is hosting the evening meals at her Anishinaabe Culture Center home from 6-8 PM. If any friends and helpers want to contribute to her efforts, please feel free to call her, or go and help. Tuesday, July 5th, 2 PM: Press Briefing and Tour of Lines #61, #13, and the Arrowhead Transmission line on the LCO Reservation. 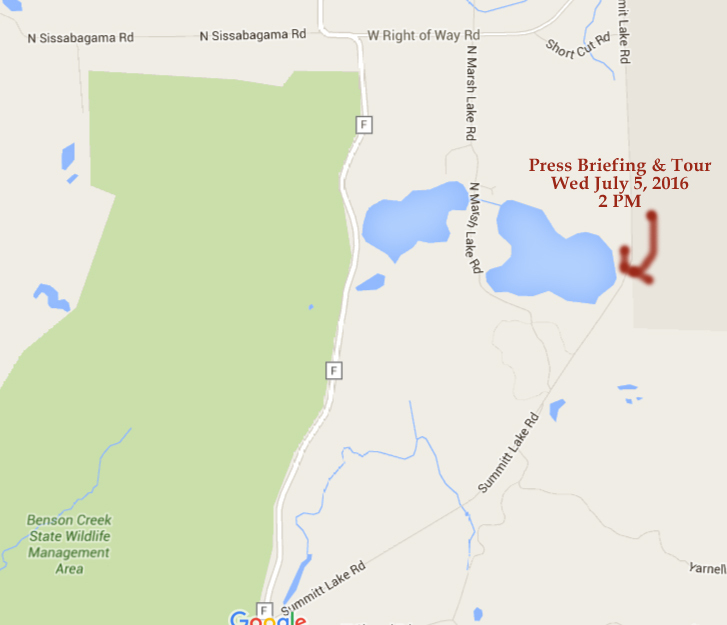 Meet at Summit Lake Road in the southwest corner of the reservation, and will include the old easement site at Highbridge on Right of Way Road and the Enbridge Pumping Station on the LCO Reservation. The LCO tribe does not get any payment for either the pipeline easement that runs through the reservation or the pumping station site. See maps below for location. Tuesday, July 5th, 6-10pm: Potluck, concert and reunion for the Harvest Education Learning Project (HELP) Camp. 6-8 PM: Melvin Gaspar is cooking the main course at the HTE powwow grounds. Contributions of veggies, desserts, fruits, liquids are welcome. Dinner will include Fry Bread, Deer Meat with Gravy/Boiled Potato and Steamed Veggies. 7-10 PM: Local speakers and music by Skip Jones, Frank Montana, Michael Buchor, Dennis & Cleo, and others. 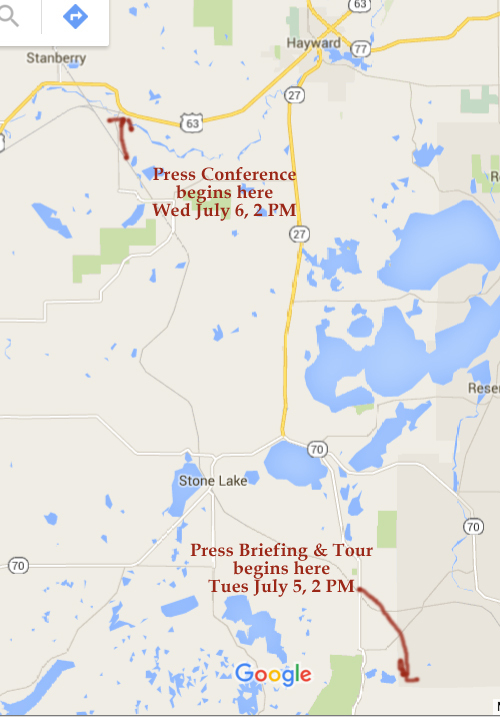 Wednesday, July 6th, 2 PM: Press Conference, Namekagon River Pipeline Crossing – Stinnet Landing Rd. Six miles South of Hayward on Hwy. 63 right before Highway E, just north of the Enbridge/ Namekagon River Crossing. Featuring LCO Vice Chair Rusty Barber, Walk organizer Julie de la Terre, Harvard Economist Winona LaDuke, activist Sandy Lyon, and several other speakers. It was here that Gaylord Nelson came in the 1960s to announce the Namekagon River being named as a wild and historic river and protected by federal laws. See maps below for location. Wednesday, July 6th, 6-8 PM: Dinner. Mel is cooking up the main course which may include Fern Soup with Dumplings, (Waagogoyn) Sunfish Fillets, Corn on the Cob and Mac n Cheese at the Honor The Earth Pow Wow Grounds. Pipeline walkers will be first in line. Thursday, July 7th, 6-8 PM: Evening dinner at the HTE grounds will be assisted by potluck from members of the Sawyer County and Lac Courte Oreilles Democratic Party. 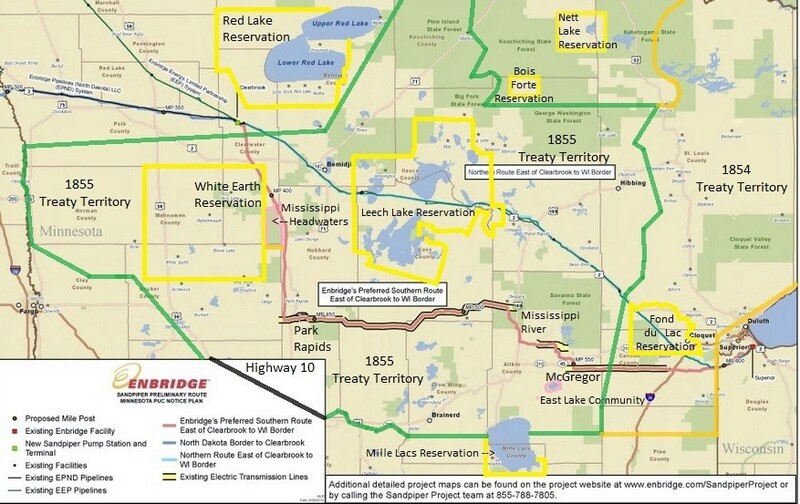 “2.9 miles from my home, Enbridge has excavated a part of its pipeline 61 corridor. The site is located just north of Akron Drive about 1 mile west of Highway 13 in the Town of Rome. (See Map). 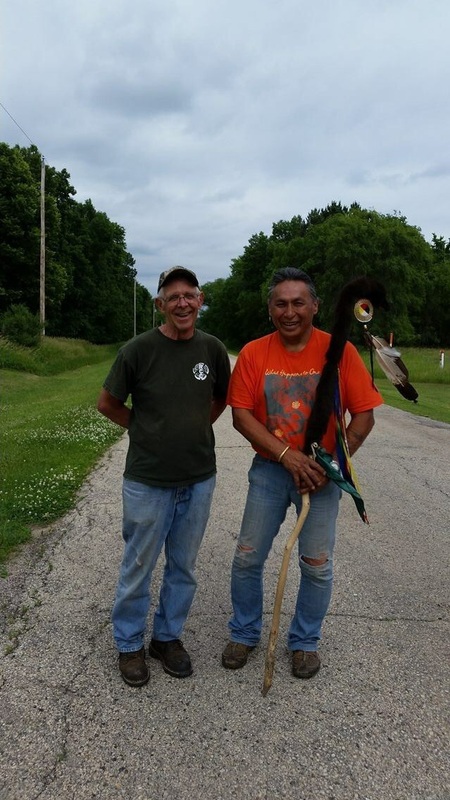 Below is Doug Cole (L) and Bill Greendeer, Ho-Chunk tribal member. Cole is the chairman of the Town of Wyocena and has been spending all his money fighting the pipeline. 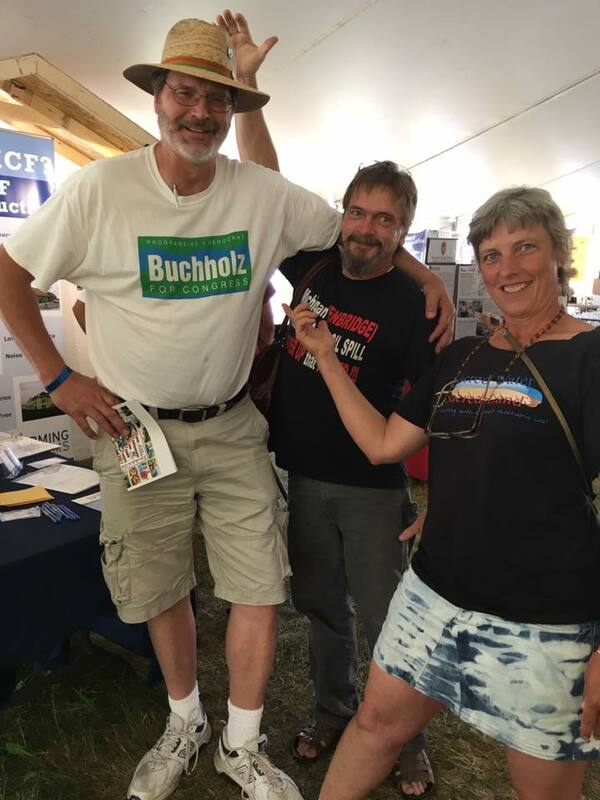 Myron Buchholz, running against Ron Kind. For the entire story, please visit the 33 Days on Twin #66 and see how you can get involved. Presentation and discussion to follow. Directions: 4 blocks east of river or 4 blocks west of 8th Street on east Grand Avenue across from the Mead Hotel. Mr. Rose is the incumbent and is currently serving on four committees of the Ashland County Board: Joint Impact Committee on Mining, Land and Water Conservation Committee, Zoning, and Long Range Planning Committee. 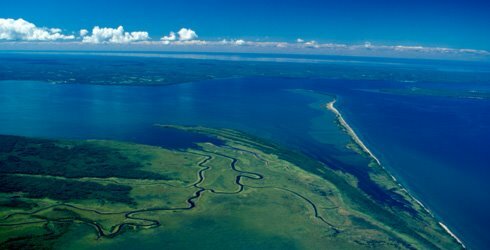 District 12 in Ashland County is unique, as it serves both Madeline Island and the Town of Sanborn, Ward 1, on the Bad River Reservation. Whoever represents this district is the voice of both island residents and the Bad River Band of Lake Superior Chippewa living in Sanborn. 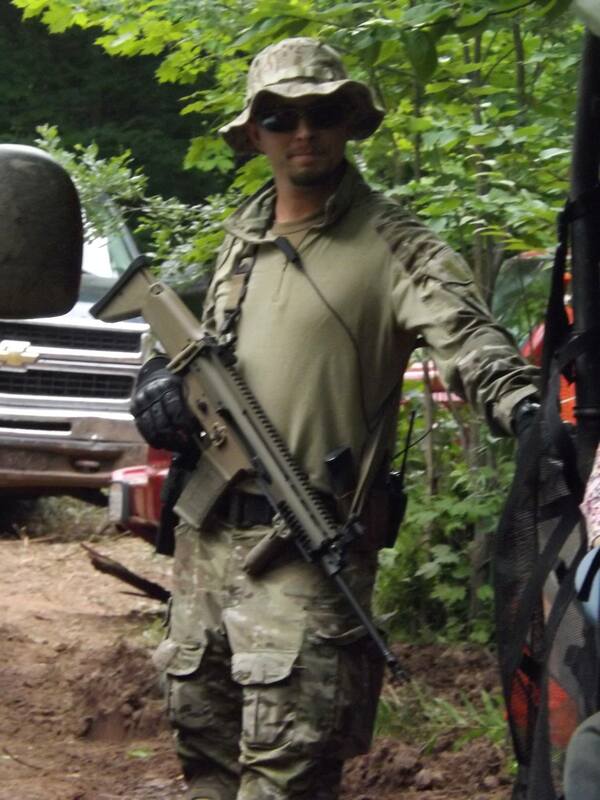 Mr. Rose grew up on the Bad River Reservation and has served on the Ashland County Board in the past. His experience with both tribal and non-tribal governments, and his love of the water and resources instilled in him growing up on Lake Superior as a tribal member have given him the unique ability to represent native and non-native alike. 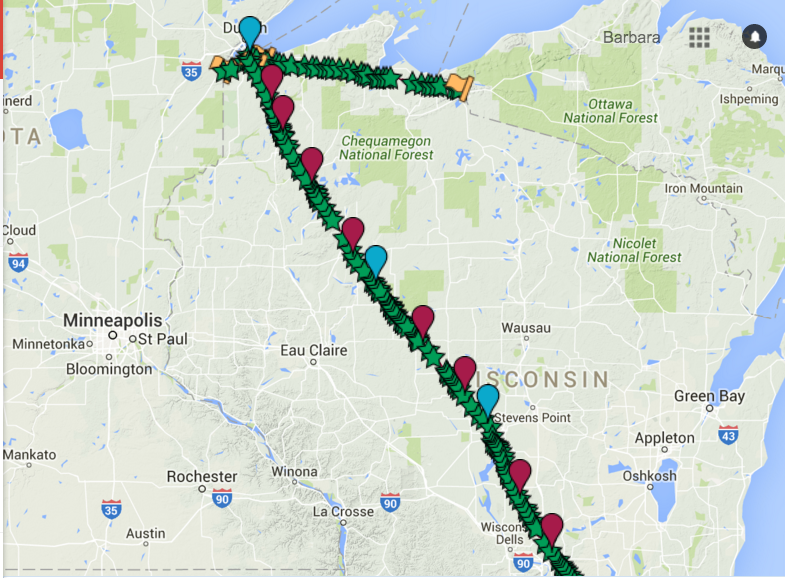 Mr. Rose has ties to Madeline Island that go back 500 years. Mr. Rose has consistently fought to protect the resources. 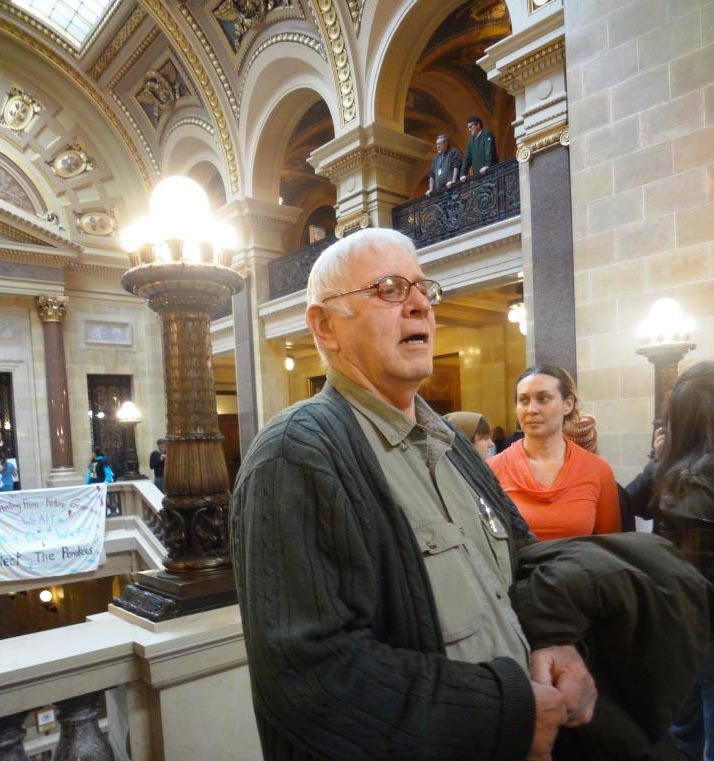 Unlike his opponent, Mike Stark, a Scott Walker supporter and Republican who backed Gogebic Taconite and their attempts to take over the Penokee Hills with a 22-mile open-pit mountaintop removal iron ore mine, Mr. Rose has stood up his entire life to fight against such atrocities. In the first video below, Mr. Rose outlines his consistent stand for 35 years against a multitude of threats to the safety and health of the area. Mr. Stark has since admitted his mistake in aggressively pushing through the “Responsible Mining” resolution while serving on the County Board in 2011 without consulting his constituents. UDW feels, however, that any future misjudgments of this nature could be devastating to the health and well-being of District 12. Reicks Concentrated Animal Feed Operation. This is a huge disaster looming in Ashland County. A 26,000 hog CAFO is on the verge of being permitted in Eileen that would destroy the water of our region. 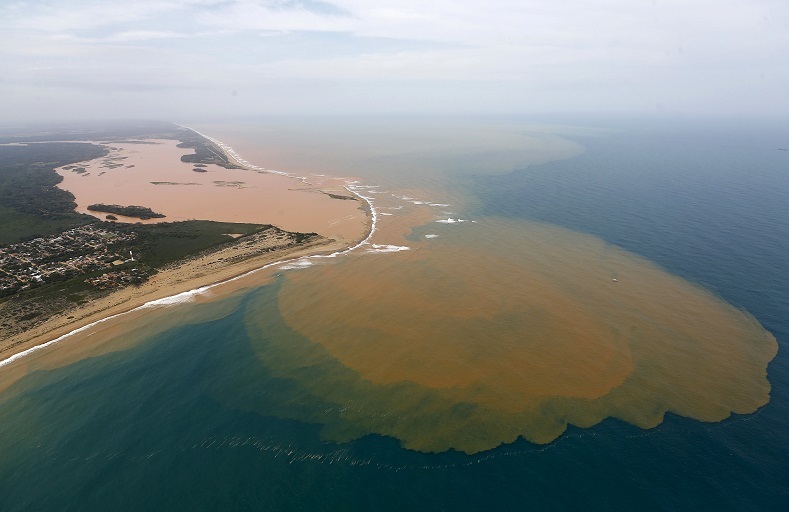 Mr. Rose not only understands this imminent danger and explains it clearly in the video below, but is already working hard on several fronts to prevent the destruction of Lake Superior that would inevitably happen if this CAFO is allowed to move forward. He is a strong supporter of local control and understands the power of the Treaties. 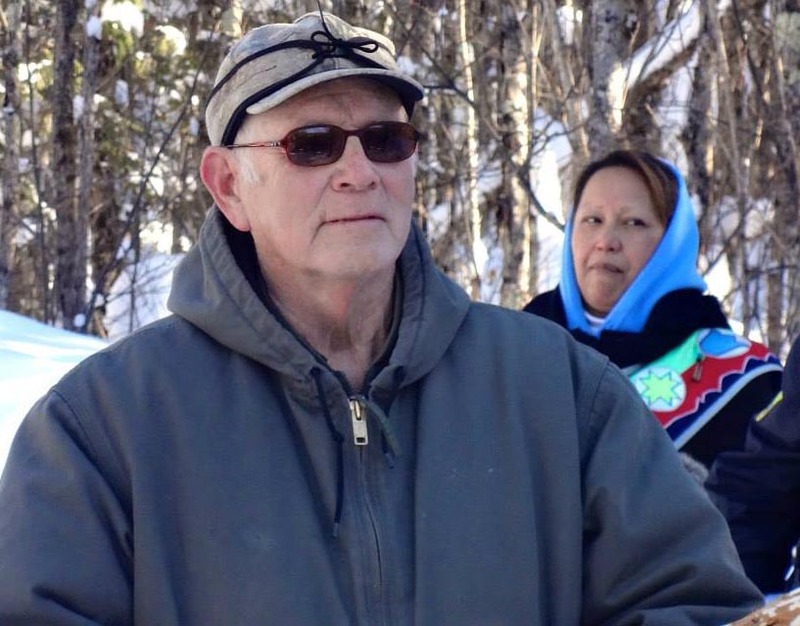 Mr. Rose is Chairman of the Anishinaabeg Environmental Protection Association. 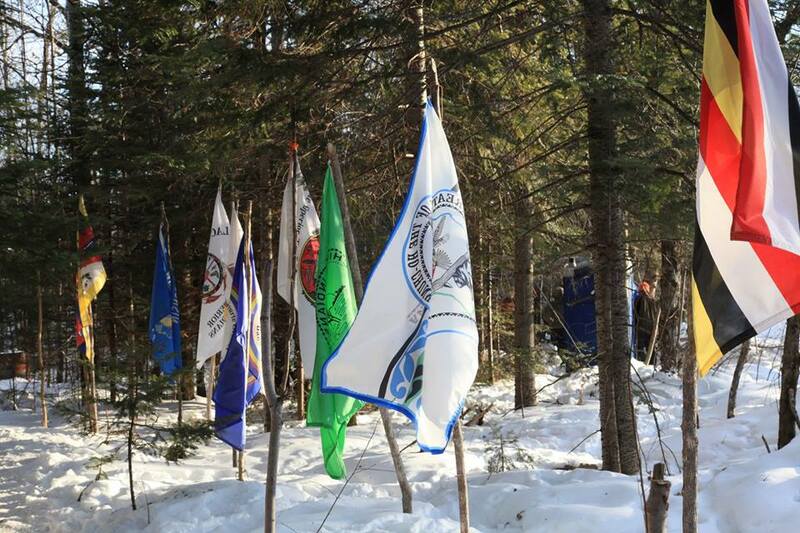 This sub-committee was formed by the Bad River Tribal Council, which works to protect the land and water for all. With Mr. Rose we have two governments standing up for us. Mr. Rose has working relationships with all of the county’s State legislators, including Sen. Janet Bewley, Assemblywoman Beth Meyers, former Senator Bob Jauch, and State tribal leaders. He also is able to bring the Ashland County Board together and has used these relationships to broker support for important issues. Board Chair Pete Russo has said his presence on the Board is “invaluable” and has strong support from the Native American community. Mr. Rose was Professor of Native American Studies for many years at Northland College. He has an excellent track record as an effective educator. For these reasons and many more, United in Defense of the Water feels he is the best candidate to represent District 12. Joe M. Rose speaking at the candidates forum, March 27, 2016 at La Pointe Town Hall.